The United States Congress designated the Glacier Peak Wilderness (map) in 1964 and it now has a total of 566,156 acres. All of this wilderness is located in Washington and is managed by the Forest Service. 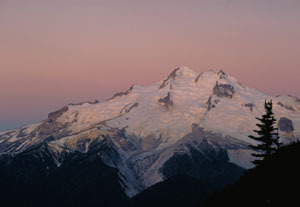 The Glacier Peak Wilderness is bordered by the Stephen Mather Wilderness to the north and the Henry M. Jackson Wilderness to the south. Glacier Peak Wilderness, which shares its northern border with North Cascades National Park, has few equals in terms of sheer ruggedness. Glacier Peak, the highest summit in the area at 10,541 feet, is more remote than any of the state's other famous old volcanoes. Above the tree line (5,000 feet to 6,000 feet), lovely meadows stretch out below the tattered ridges and the dozen or so summits draped with active glaciers, while below the tree line you will wander through dense forest cover. Ultimately, the steep fractured walls and ragged peaks lead to deep U-shaped valleys tangled with huckleberry and other woody plants. Numerous ice-cold creeks splash gloriously through the valleys from their sharp drainages. Other bodies of water include more than 200 lakes, many unnamed and tremendously difficult to access, in various cirques and hidden basins. Wildlife species include several that epitomize Wilderness: grizzly bears, wolverines, gray wolves. Snows accumulate to depths of 45 feet on the west side of the crest. The paths of old avalanches mark some of the forested hillsides. The 450 or so miles on as many as 100 trails vary from relatively easy hiking on maintained footpaths to starkly strenuous and seldom-used old animal trails. The Pacific Crest National Scenic Trail (PCT) follows the crest through the area for about 60 miles. The Suiattle River Trail acts as the main route from the west side, a pathway that travels 7.0 miles and joins the PCT. Above timberline, the land opens invitingly to cross-country travel. Climbers have put up routes on at least 140 peaks and faces in the area, and the rock climbing rates among the best in America. Blue Mountain, for example, in the northern portion of the area, boasts a 700-foot granite face with routes rated as high as 5.10. Some of the faces in the Wilderness exceed 1,000 feet. Planning to Visit the Glacier Peak Wilderness? How to follow the seven standard Leave No Trace principles differs in different parts of the country (desert vs. Rocky Mountains). Click on any of the principles listed below to learn more about how they apply in the Glacier Peak Wilderness.